A few months back, I applied for a job. This job was based out of San Francisco, but was listed as "freelance", so I thought, "what the heck, I wouldn't mind driving to San Francisco every once in a while." A few weeks passed, and I had completely forgotten about it, until one day I received an e-mail from the company asking if I was available for an interview the following day. I was SO excited, and also SO nervous. The company - Darby Smart - was going to be calling me! I spent the night researching everything I could about the online crafting hub. I discovered the co-founder (Nicole Shariat Farb) is a complete #girlboss. A teacher turned investment banker, she came up with the idea of Darby Smart after having multiple craft fails while preparing for her wedding. Within the first year, the company raised $6.3 million in seed funding, and has taken the DIY world by storm. All of this information made me even more nervous for my phone interview, because it ignited a spark to realllllly want to work for the company. I admired everything they stood for. When the time came around for my interview, I was shaking, but I kept my cool, and think I did a great job answering the interviewer's questions. At the end of the call, I brought up that I was rurally located, and would only be able to come into the office once or twice a month. Everything deflated when she said that wouldn't be feasible whatsoever. I was bummed, but decided to inquire about designing some crafts for them. To my delight, she said yes! So, fast forward a few weeks and here we are. I am so very excited to show you my first Darby Smart project! Step 1: Place you paints in small containers for easy usage. Then, use painters masking tape to mark off stripes. I used three to four pieces of tape to make different sized stripes. Step 2: Make sure the tape is pressed firmly to the cloth so that paint cannot seep under. Use a foam or paint brush to paint each stripe a different color. Step 3: Next, carefully remove the masking tape, and allow the paint to dry for about 30 minutes. Apply a second coat if desired. Step 4: Turn your iron to the heat setting that is appropriate for your fabric, then make sure the steam setting is turned off. 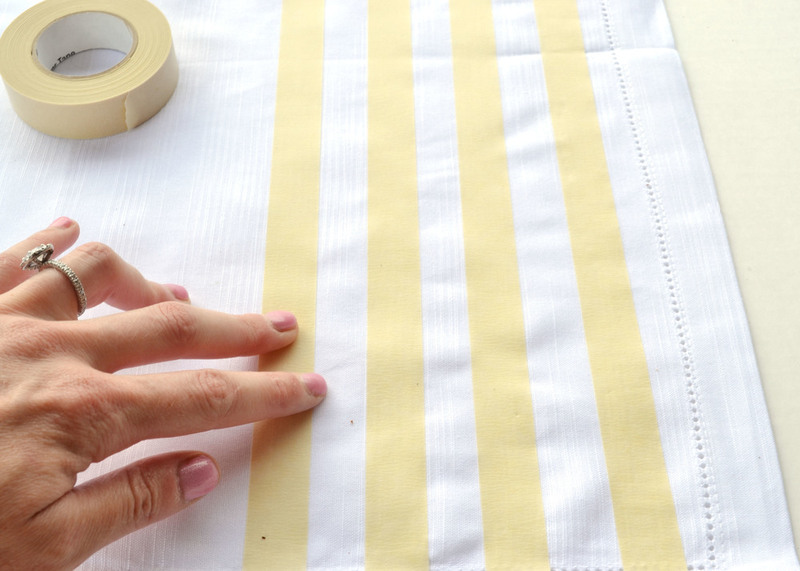 Protect your design from direct heat by either turning your fabric over to the backside, or by placing a piece of scrap fabric over the front of your design. Set your design by slowly ironing over it for 20-30 seconds. Note - At first, I did not iron my napkins, and after I washed and dried them, some of the paint had worn off, which I LOVED. A second coat, and ironing will help keep the paint from wearing off. If you've never shopped at Darby Smart before, let me fill you in. It's sort of like a Birchbox for crafting, only it's not subscription based. Plus, it empowers designers and small businesses, because a portion of every purchase made through a 'DIY Project' is given back to the designer. The company also sources American made products and artisanal goods to support small businesses. Be sure to head over to my profile and check it out!